Even though I am new to the "blogging world" (as far as having my own blog). I have been a "viewer" for quite a while now. 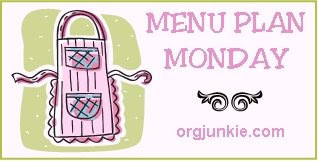 And one of the first blogs I started reading was orgjunkie.com, so joining her Menu Plan Monday is quite a "blogging milestone" for me!! One for which I am excited about but am also crossing my fingers that I do correctly. I tried last week only to realize I posted my name on her site without connecting any links...did I also mention that I am also techie challenged? Mon - Mexican Chicken (recipe courtesy of Paula Deen) - This recipe is great for a quick and easy weeknight meal. Especially if you use a Rotisserie chicken like I do! Preheat oven to 350 F. Grease a 13x9 pan w/ butter. Layer the tortillas, the chicken mixture in the pan, beginning and ending with the tortillas. Sprinkle the cheese over the casserole.